Alchemy, and its association with the quest for the always-elusive philosopher’s stone, is one of the most fascinating aspects of early modern science. It was not only a tool to effect the transmutation of metals and create medical remedies, but also a philosophical and theological pursuit. Its most famous practitioners include John Dee, Isaac Newton, and Theophrastus Bombastus von Hohenheim, more commonly known as Paracelsus. The alchemical work of Paracelsus in particular has attracted considerable academic interest: from Walter Pagel’s analysis of his medical philosophy, published in the mid-twentieth century, to Charles Webster’s more recent studies of Paracelsus’ social and theological mission. These men might be well-known, but they were not the only alchemical practitioners. Tara Nummedal has shed light on the career of Anna Maria Zieglerin, a sixteenth-century German alchemist in the court of Duke Julius of Braunschweig-Wolfenbüttel, whose work focused on childbearing and fertility. This is complemented by the work of Alisha Rankin, who has brought attention to what she terms “noble empirics”: German noblewomen who created medical remedies using their empirically gained knowledge. 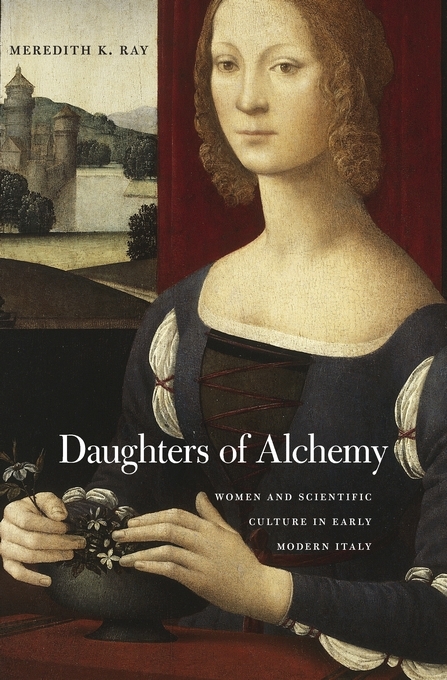 Meredith Ray’s new study Daughters of Alchemy continues this discussion of female practitioners. Her analysis of Caterina Sforza, the noblewoman from whom the Medici grand dukes were descended, provides an Italian counterpart to Rankin’s empirics. Sforza was actively engaged in the scientific empiricism of the age, and was a collector of “experiments”: personal recipes based on alchemical principles that could fulfill a variety of useful functions. Some were used to make cosmetics or medicinal remedies, and others were used for the traditional alchemical pursuits of creating—or mimicking—gold. These recipes reveal the ways in which alchemy was a practical pursuit for noblewomen, whether as a means to preserve health and beauty, or maintain control of their finances. Sforza wrote her recipes in a private manuscript—a true “book of secrets”—but in the sixteenth century these compilations of recipes were also published, forming a popular literary genre. While these books contained knowledge that appealed to both sexes, many of their recipes offered advice tailored specifically to females, such as how to make breasts small and firm. This indicates that women were an intended audience for these texts. Yet only one book of secrets, the Secrets of Signora Isabella Cortese, is attributed to a female author, and even the Secrets’ female authorship is dubious. Ray ties this male authorship of books of secrets to the wider early modern desire to uncover the so-called “secrets of women.” This special knowledge of the female body, which was believed to be possessed only by women, was a topic of great interest for early modern medical practitioners; and Ray argues this is echoed in the male authorship of books of secrets. But even though these works were most often written by men, their distinctly feminine content is an indication of women’s continuing interest in practical alchemy. Although her monograph is titled Daughters of Alchemy, Ray’s focus extends beyond alchemical practice. The second half of the work shifts away from alchemy and towards natural philosophy, particularly how women deployed it in literature. The Venetian authors Moderata Fonte and Lucrezia Marinella used their understanding of scientific discourse and natural philosophy as weapons in the querelle des femmes, the ongoing literary debate about the proper role and status of women. Both Fonte and Marinella incorporated scientific learning into their narrative works to make keen observations regarding the inherent intelligence of women and their equality with men. While these two authors did not engage with the empirical practice of Sforza and Cortese, their literary output shows that women could engage with scientific knowledge outside the confines of a university. In that sense they are similar to the seventeenth-century English noblewoman Margaret Cavendish, another early feminist author and natural philosopher whose scientific contributions have attracted academic attention in recent years. Ray’s final two case studies are the most directly engaged with the so-called Scientific Revolution. Camilla Erculiani, an apothecary from Padua, published her Letters, a scientific treatise in epistolary format, in 1584. This work combined her knowledge of Galenic and Aristotelian thought with her understanding of alchemical processes to describe the causes of the great flood. Margherita Sarrochi, who was famous for her learning and hosted a salon that attracted many leading scientific figures, did not publish any scientific works of her own. This did not, however, prevent her from participating in scientific culture. She corresponded with no less a figure than Galileo: not only about her own epic poem Scanderbeide, but also about his astronomic discoveries. The letters of others corroborate that a high value was placed on her opinions, and emphasize the prominent role she played within her scientific network. None of the women Ray describes held formal positions at the great European universities, and the vast majority of published scientific treatises were written by men. But as the work of Ray and others are making increasingly apparent, early modern scientific culture was not limited to male academic circles. Women practiced alchemy within their households, incorporated scientific learning into their literary pursuits, and offered their opinions on scientific treatises. As Ray states in her introduction, “It is not women who are missing from the picture: it is our lens that must be adjusted to perceive them” (4). Daughters of Alchemy certainly does this. Elisabeth Brander is the rare book librarian at the Bernard Becker Medical Library of Washington University in St. Louis. Her academic interests include anatomical illustration in the early modern period, the history of obstetrics, and the connections between magic and medicine.